In this post, you’ll find out about 10 underestimated cities in Europe which are amazing and are totally worth visiting. But first, I have a question for you. Have you ever been to a place (city, town, village), which impressed you a lot but for some reasons weren’t very famous and when you were telling your friends about your impressions, everybody was somewhat sceptical: oh, cool, but I haven’t been to London (Paris, Barcelona etc) and I would like to visit top-priority cities first? That happened to me so many times! People seemed to be just indifferent about my enthusiastic tales and persistent advice to visit “that one town”. And it always seemed so unfair to me! I feel like these cities deserve a lot of attention. Because everyone knows Paris anyway but not many people have heard of Segovia (which is only 1 hour away from Madrid and is truly an unforgettable city). But just because these places aren’t “cool and trendy” they are often ignored by tourist. That is why I decided to write a post about 10 amazing but underestimated cities in Europe. Maybe, after reading it, someone will add one (or hopefully more) cities from this post to their to-visit list. For me personally, the most underestimated city in Europe is Segovia in Spain. As I’ve already mentioned above, Segovia is just wonderful. Located not so far away from Madrid (1 hour by bus) it’s as different from Madrid as it can be. Surrounded by pretty high mountains covered by snow (in winter), it has a very special architecture: a huge aqueduct in the city centre, a castle (somewhat resembling the Disneyland castles) and old medieval streets with plenty of beautiful churches and cathedrals. Once you get to Segovia, you will start feeling like in the museum. The city just doesn’t look like a real one at all. It resembles a huge mock-up of what a fabulous medieval city would be. However, it’s 100% real and inhabited. But why do I need to describe it? Better look at the photos! Looking for accommodation in Segovia? Why not stay at Hotel Don Felipe? Or just check all the available hotels in Segovia! Even though Seville is a big city, it isn’t as well known for tourism as, for example, Barcelona. Honestly, when I was there in winter, there was a very scarce amount of international tourists (unlike Madrid, which was very overcrowded by foreigners). However, Seville is one of the most beautiful cities, I’ve ever been to. It also has a great climate (even in winter it’s very warm there, around 18-22 degrees, but in summer it’s actually very hot) and super tasty & not so expensive food. A paradise! Seville has fabulous parks and a huge palace with a channel and even gondolas (like in Venice), an Alcazar (where the Dorne part of Game of Thrones was filmed), plenty of amazing cathedrals and churches and even a stadium for Bullfights! Let me tell you a small lifehack – the best day to explore Seville is Monday! Why? Almost all the museums are free on this day! Isn’t it amazing? Read more about free museum entrance in this post about Seville! Looking for accommodation in Seville? We stayed at La Flamenka hostel and it was alright. However, there are way better hotels in Seville and you can find them all here! Sintra is a truly magical place, which you have probably never heard of. It has two truly unique and very unusual palaces (Sintra Palace and Pena palace) and a huge medieval fortress. It’s quite easy to reach from Lisbon (by bus) and can be visited in one day. However, if you want to stay there for a while to explore the whole region, you can book a hotel in Sintra. Zelle is a unique and pretty small city in Germany which wasn’t bombed during the WWII and thus kept all these amazing Fachtwerk-style houses. All the city centre is built in this Fachtwerk-style and even on a worst rainy day, the city looks impressive (and very cute). I had the worst luck, so it was raining a lot this day when I decided to visit this beautiful town, but I still enjoyed it and I’m sure you’ll enjoy in too! Even though Berchtesgaden is located in Germany just Zelle it’s hard to find two cities as different as they are. Zelle is located in the northern part of Germany, surrounded by flatland and fields; Berchtesgaden is a typical hideaway-style highland town surrounded by German Alps, full of mountaintop hotels and spas with thermal water. It also has its unique style of architecture! And moreover, beer in Berchtesgaden is impeccable and food – finger licking (not for vegetarians, though). Why not check the best things to do in Berchtesgaden? I wrote a whole post about it! Read it here. Looking for a place to stay in Berchtesgaden? Look no further than AlpinaRos Demming! We stayed there, loved it and wrote a review of the hotel. In case you’re looking for something more affordable, you can find more hotels here. Graz is definitely not as famous as Vienna or Salzburg but it also has its charm. It’s more calm and quiet compared to Vienna and much bigger (and I would also say more cheerful) than Salzburg. The most famous landmark of Graz is its Uhrturm (clock tower) located on a hill in the centre of the city. If you climb that hill, you’ll see an amazing panorama of Graz. I spent in this city 2 weeks during my school exchange and I never got tired of the city! It’s amazing for a summer getaway, if you want to enjoy great weather and explore Austria. Looking for accomodation in Graz? Check Hotel Süd, it has an increble rating! Or check any of these hotels. Piran is an Italian-style Slovenian city located on the Adriatic cost. It has plenty of narrow streets and a beautiful square which somewhat resembles Venice! Piran is not as crowded as Italy (and definitely much cheaper). And if you climb on top of the tiny hill in Piran, you’ll see a wonderful panorama of the city. 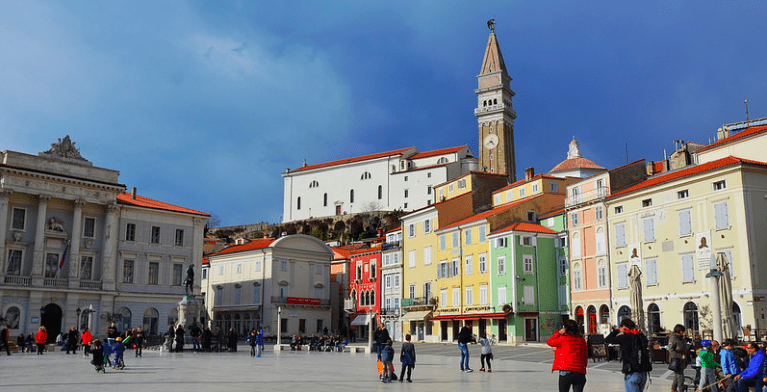 Piran is one of the 3 best cities to visit in Slovenia. To find out, what the other two are, check this post! It’s a great destination for a weekend trip, but it gets fully booked quite quickly! So make sure you secure your accommodation in Piran, Slovenia in advance. This tiny French town is located just 20 minutes drive away from Cannes. However, it’s not so famous, and most of the people, going on a road trip around the French Riviera, omit this amazing town. Of course, 1 day would be too much for this city, but one very sunny morning would be perfect to visit this medieval toylike town. We visited St. Paul de Vence as part of our road trip around French Riviera. Technically, you can stay in a hotel in St. Paul de Vence, but I would recommend you to stay in Cannes instead! Most of the people usually don’t mention tourism or sightseeing when referring to Glasgow. And certainly, they don’t feature it as one of the underestimated cities in Europe. However, the biggest city in Scotland has some wonderful places to visit and is actually very nice in general. In Glasgow, you can actually spend from 1 to 3 days in order to see the city properly. What is there to see? Well, first of all, the impressive Glasgow Cathedral and cemetery nearby. Secondly, the main street and the city centre (it’s actually great for shopping!). And, most importantly, the Glasgow University! If you like walking, better go there on foot (since it won’t take more than 40 minutes) but the walk is very nice. And you’ll see some pretty amazing places on your way there. Moreover, there are two fabulous museums next to the University, worth spending a day there! Check this post: “Free things to do in Glasgow”. Also, Glasgow is a great hub for exploring Scotland – you can get to Scottish Highlands quite fast. Last November, we did a road trip around Scottish Highlands just in one day. Looking for best places to stay in Glasgow? I’ve heard that hotel CitizenM is very good. Or just check the Glasgow page on Booking.com! And the last (but not least) is Naples. Who hasn’t heard of Naples? Then why is it there? Well, despite the fact that people actually know Naples, they prefer not to go there because of the reputation of the city. Oh, my, oh my. Naples is amazing! And not because there’s the famous Pompeii museum nearby. Naples is a very authentic city! In only was there for 1 hour, but I definitely would like to come back there. Food in Naples is amazing, too. And very affordable, too. Most of the hotels are decent, too. Check some of these hotels out, in case you’re planning to visit Naples. Have you liked this post about 10 underestimated cities in Europe? Pin it on Pinterest! Your ultimate guide to the rides in Universal Studios Singapore! Thanks for the link – really appreciate to see Glasgow on this list 🙂 I also need to get myself to Naples – I’ve been always dreaming about that city! We feel the same way that you do about the major tourist cities. We would much rather get out and explore those cities that are off the radar so to speak, we have found that there are less tourists in theses places, prices are cheaper because of this and often they are as beautiful if not more beautiful.. We were lucky enough to see Seville in February, twice actually. Another city that we loved was Bergamo just outside of Milan. I could go on and on naming fantastic cities that we have visited, just in our last trip to Europe this past winter as well as ones we have seen on past visits. People shake their heads at us when we say we didn’t stay in Rome or Florence or Madrid but they just don’t get it, that we enjoyed seeing these other places instead and that isn’t to say that we won’t go and explore these cities they just weren’t a priority on this trip. I totally agree with you, guys! Haven’t been to Bergamo yet, but it sounds very promising. I would recommend you the Balkans – it’s not yet very popular, but it’s AMAZING! Wrocław in Poland should be on the list! Cheap, amazing food, 1.5hrs from London by plane, rich history and excellent shopping.